Morning ladies! 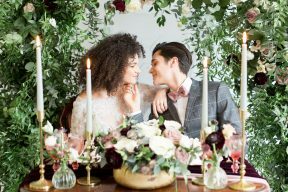 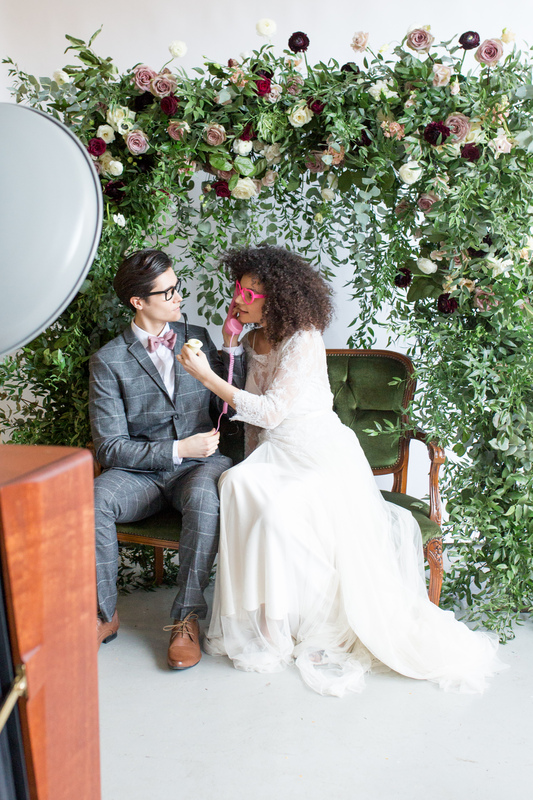 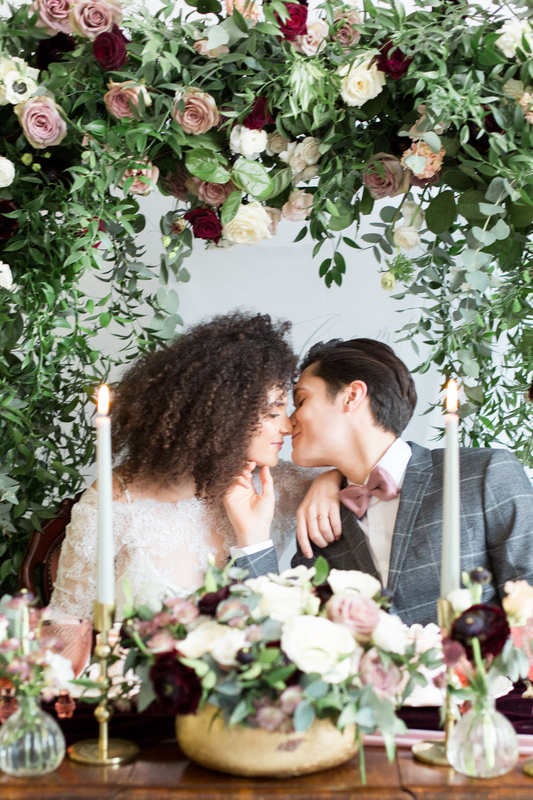 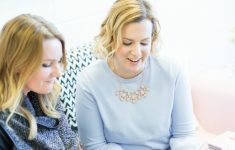 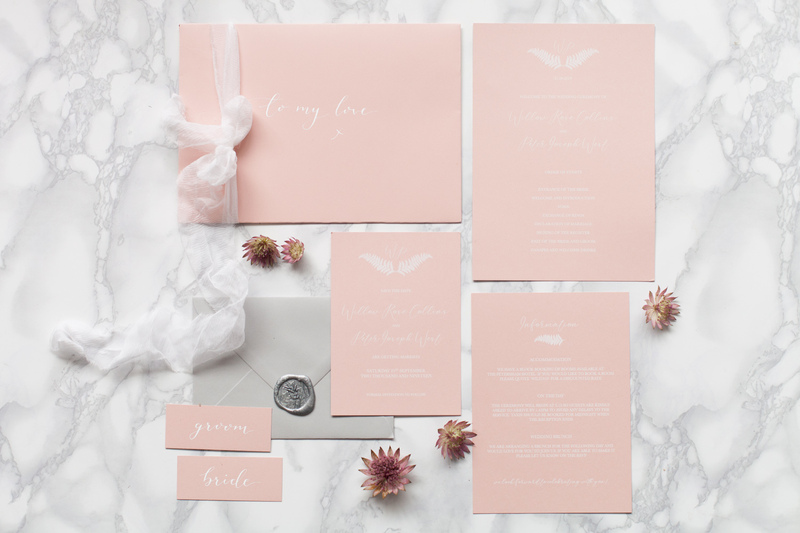 It’s been a while since I’ve had the opportunity to write here, but I am so thrilled to be back with this gorgeous shoot I styled and curated earlier this year with photobooth brand Everybooth, captured by Helen Warner Photography. 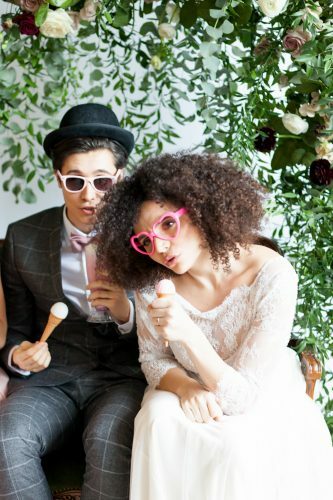 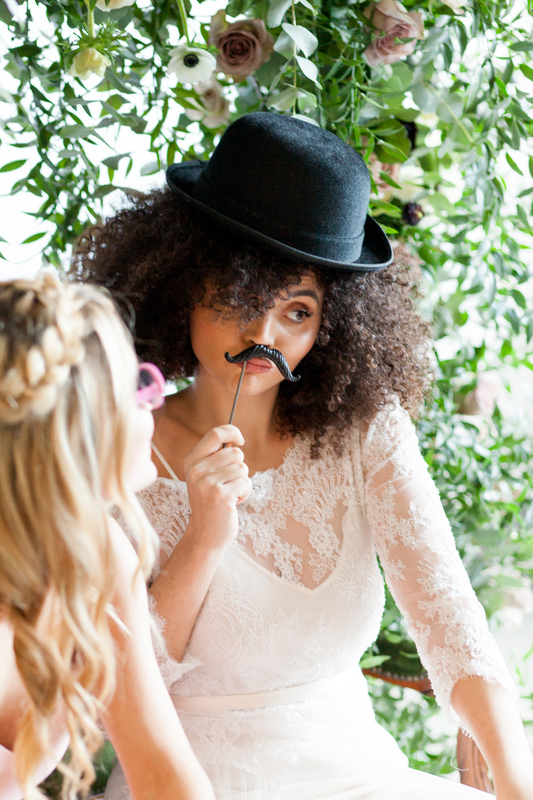 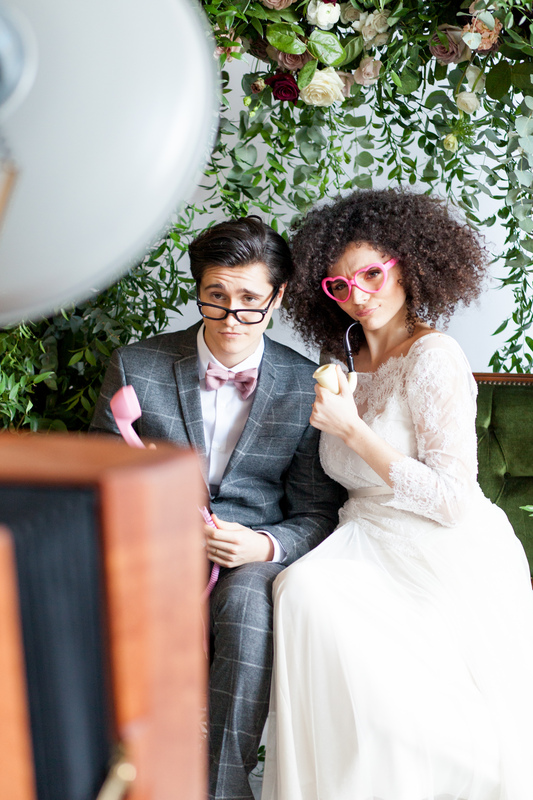 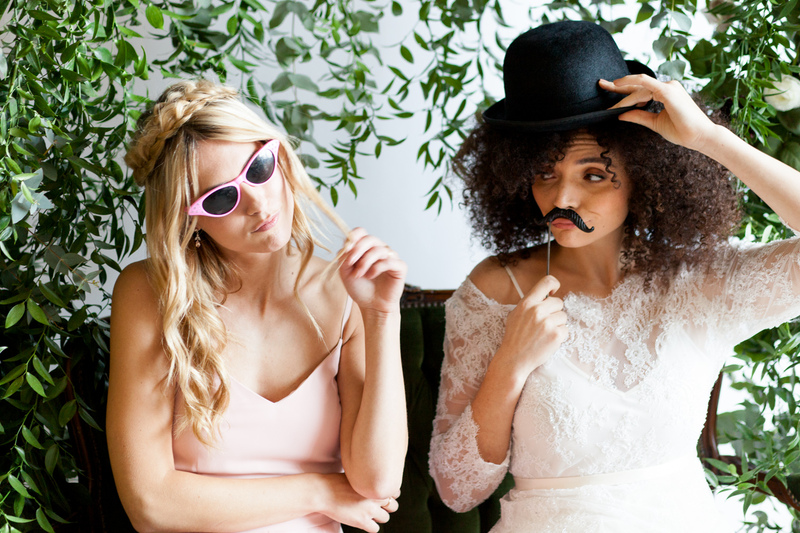 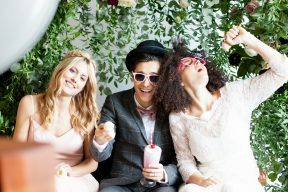 If you’ve been considering a photobooth for your wedding, but have been uninspired by the options out there, then Everybooth is the super stylish alternative you’ve been looking for!! 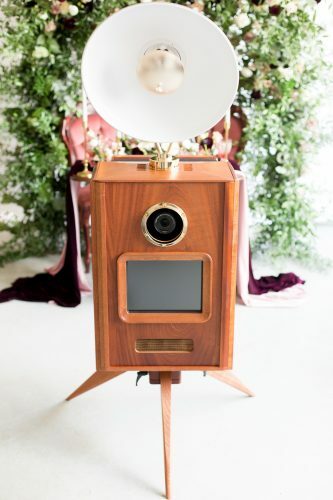 Unlike the temporary passport-photo-style boxes or pop-up vintage options, this traditionally crafted wooden booth is a modern reincarnation of the Victorian camera-box of old – and it’s BEAUTIFUL! Inspired by the modern retro lines and oak cabinet of the Original booth, I combined mid-Century style with a thoroughly modern take on greenery! 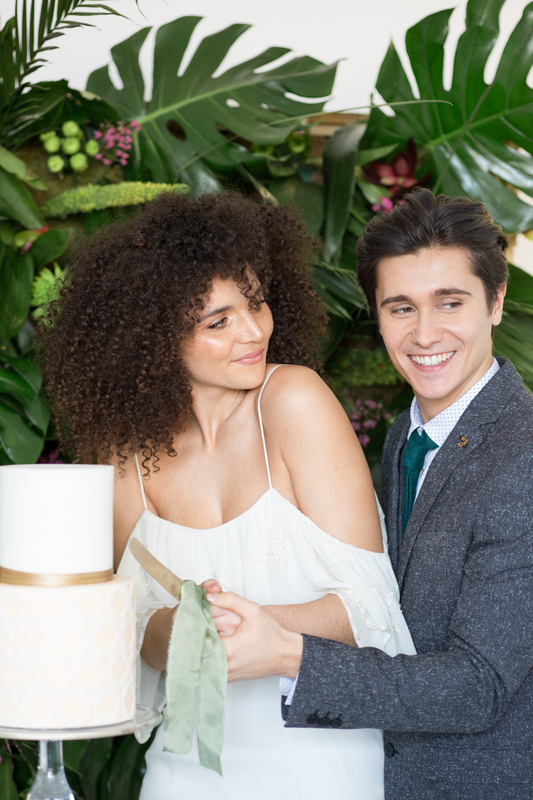 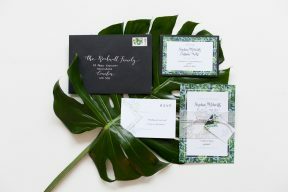 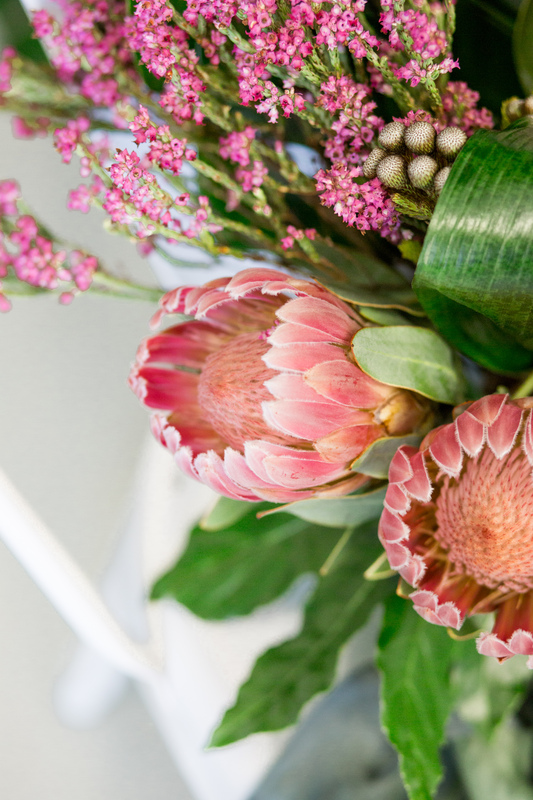 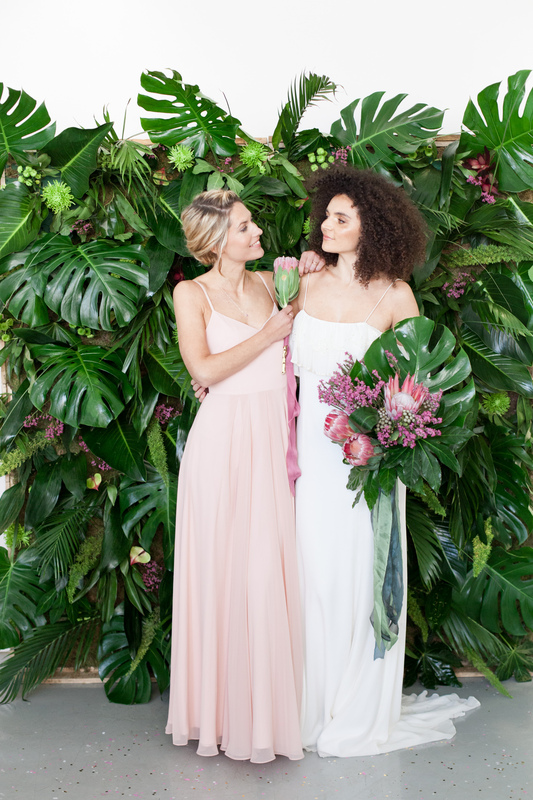 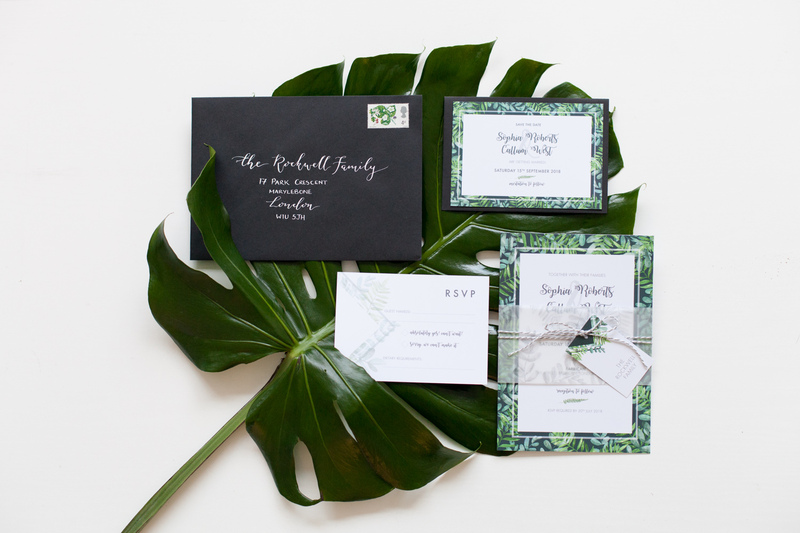 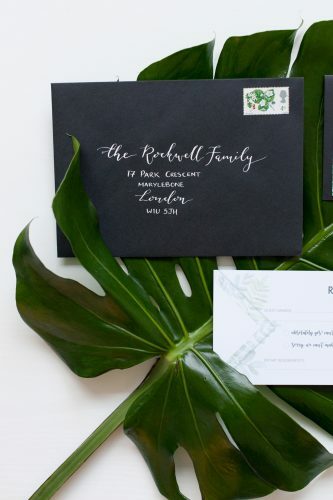 Emma Soulsby Flowers crafted the most amazing green backdrop, incorporating shiny palm leaves and tropical blooms to create a stunning ceremony backdrop. 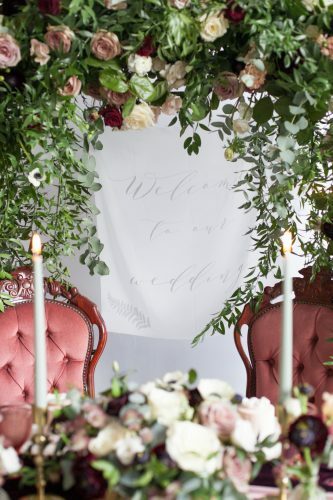 Whether you’re getting married outdoors, or in a contemporary blank canvas, can you not just imagine saying your vows here, complete with guests sitting on sleek white Tolix chairs (kindly provided by Hire It). I’m pretty sure you’ll love bride Amy’s off-the-shoulder Bo & Luca gown sourced from B.LOVED fave Luella’s. 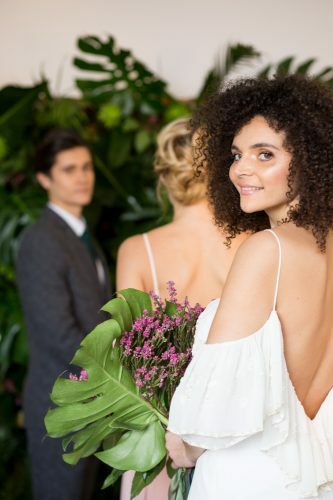 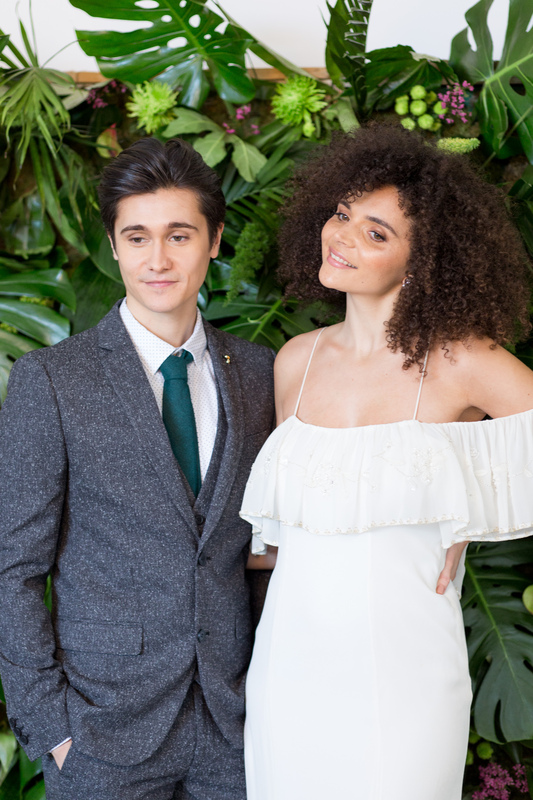 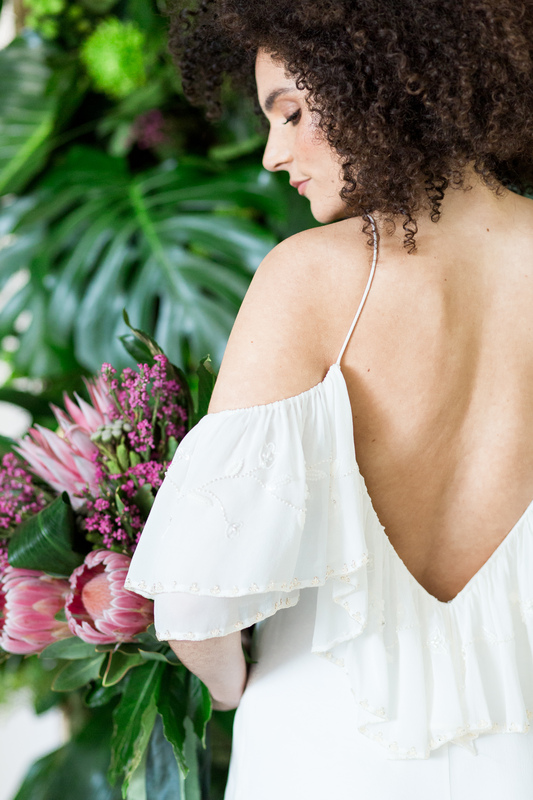 We adore this chic brand for it’s boho-luxe style and this dress with it’s clean lines, delicate botanical detailing and stunning V-back makes such a statement as you walk down the aisle. 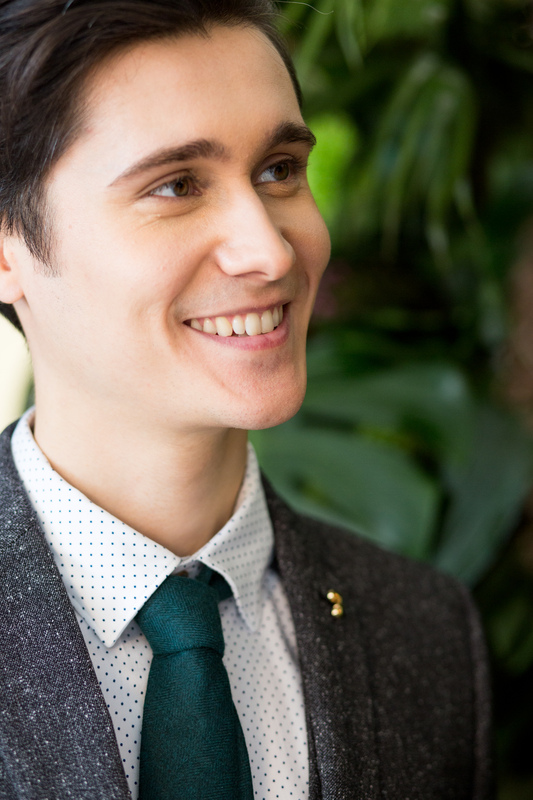 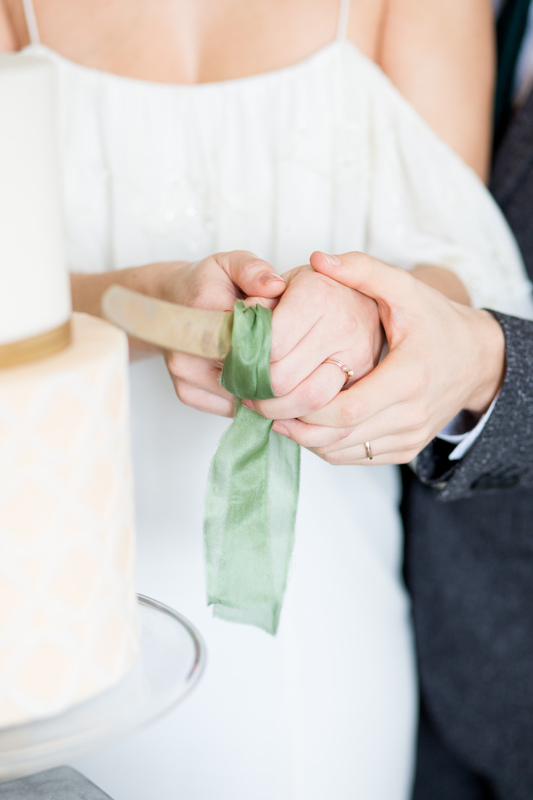 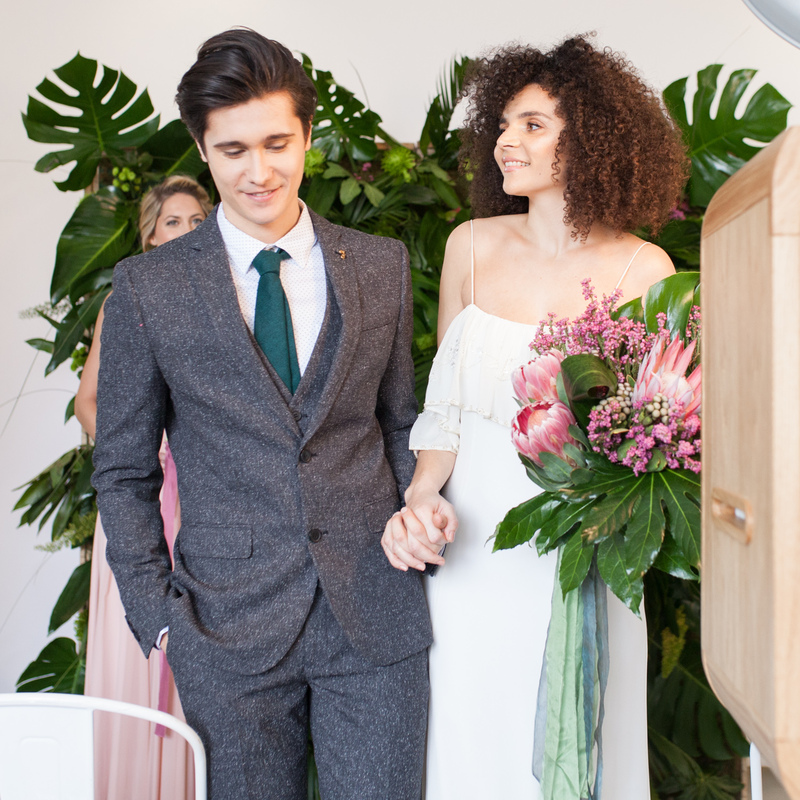 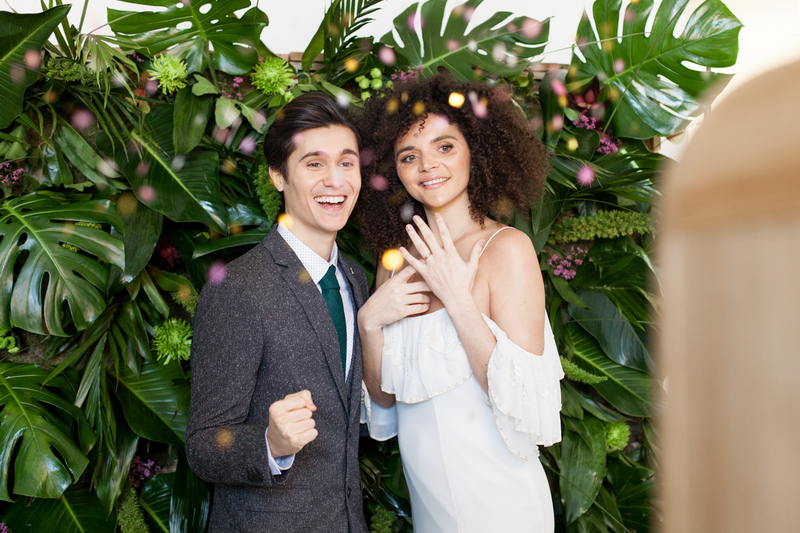 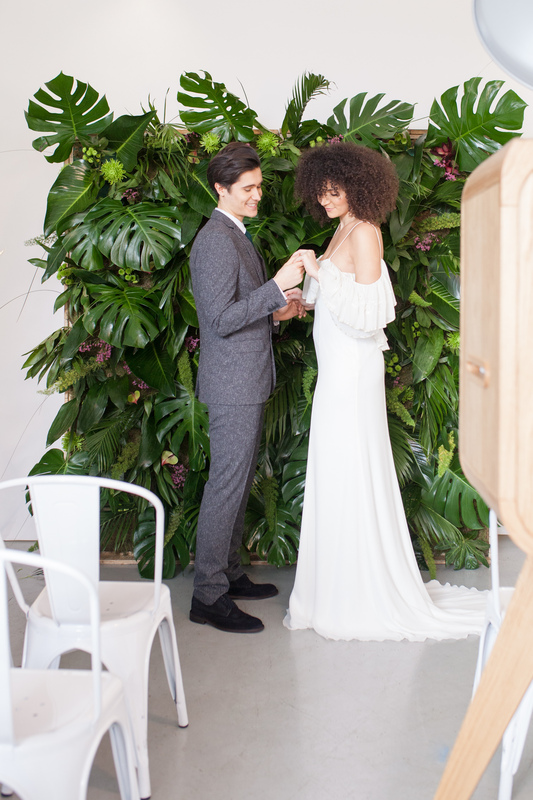 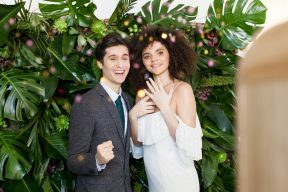 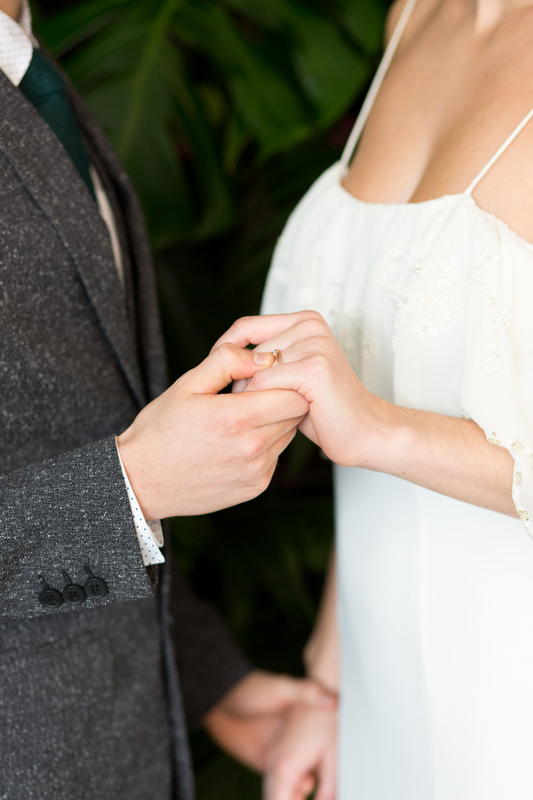 Her groom, Aleksy’s outfit has retro vibes, in an updated tweed suit with touches of emerald green picking out those gorgeous palm leaves in the backdrop and Amy’s oversized bouquet (which, by the way, we LOVED!). 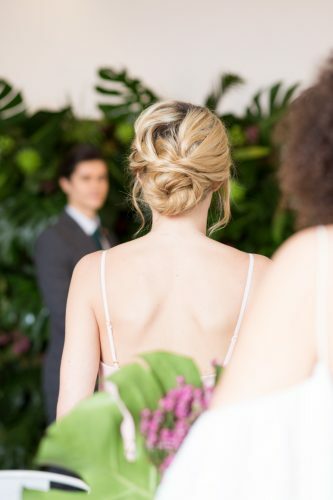 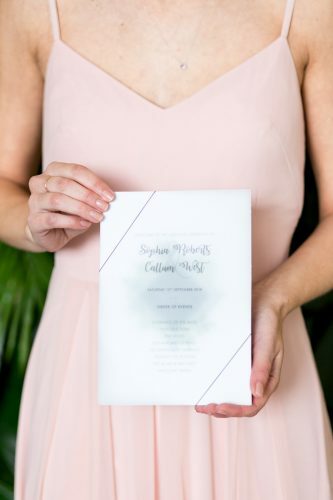 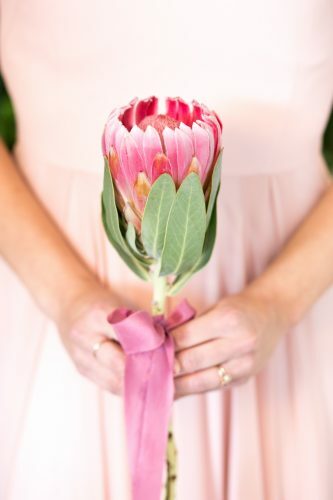 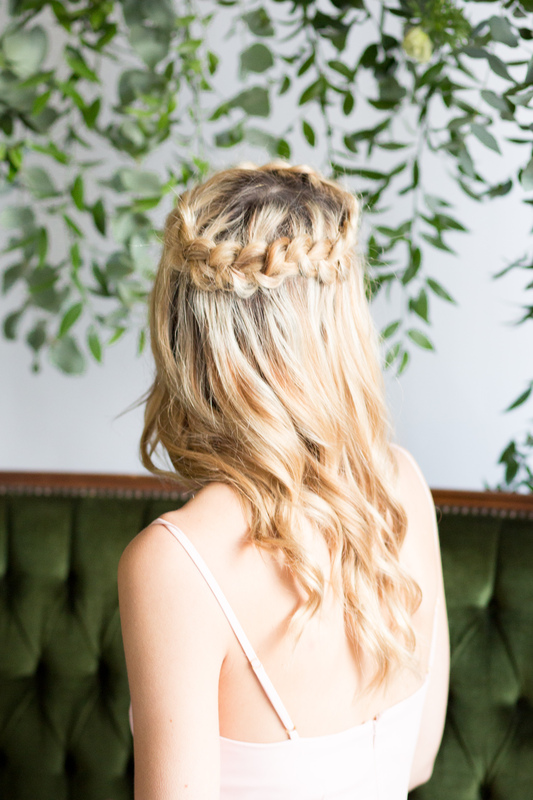 Our bridesmaid Katrin’s, understated blush dress from TH&TH is accessorised with this year’s hottest hair trend, a fashion-forward side braid swept into a stylish chignon by Pipa Cross from BeYou Weddings. 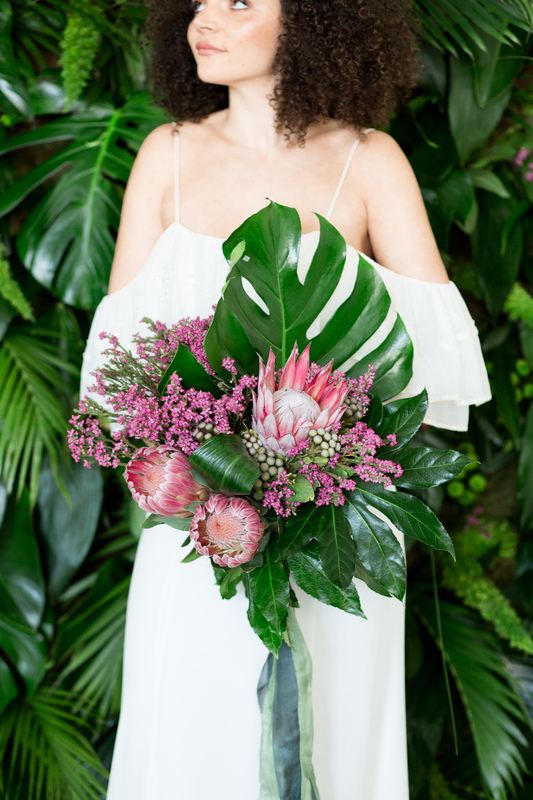 I finished the girls’ look with jewels from one of my favourite designers, Nikki Stark, who’s simple designs and coloured stones are the perfect match. 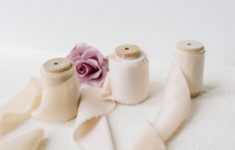 If you’re looking for your wedding bands or pretty gifts for your bridesmaids, then you should definitely check her out! 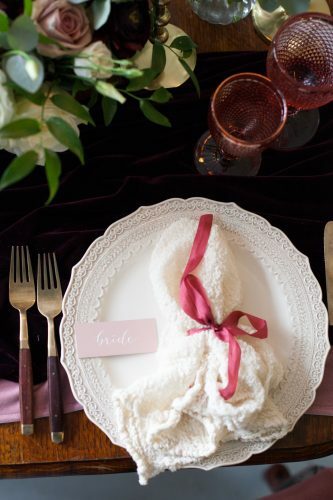 Of course, this is B.LOVED, so I couldn’t resist adding in a few details! 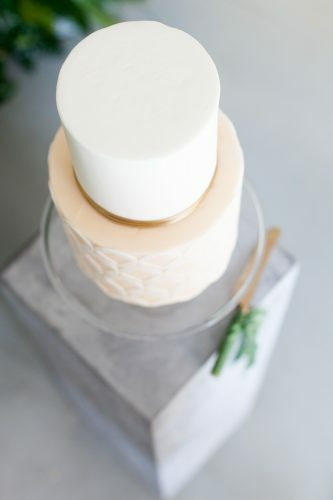 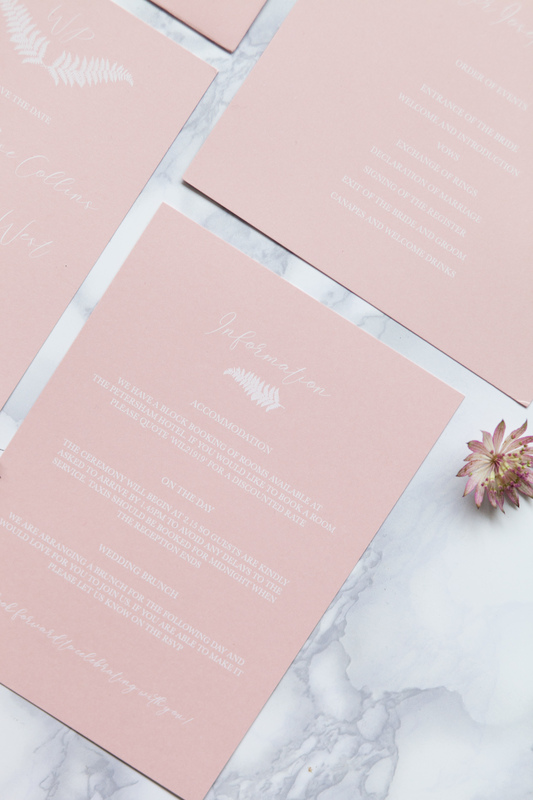 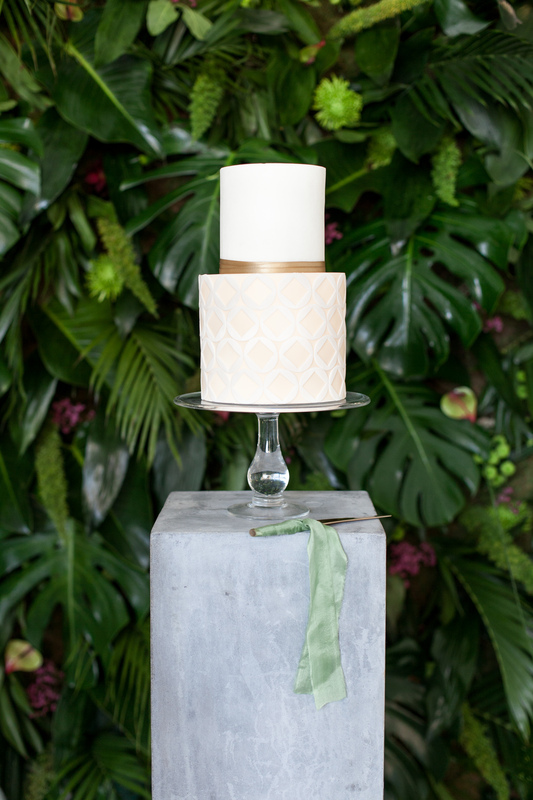 Jacquie at White Olive Design Studio created a simple and elegant modern botanical stationery suite that picked up on the colour scheme and details, while Jasmine from the Little Cake Garden created a simple and elegant two-tier wedding cake that contrasted perfectly with our foliage backdrop. 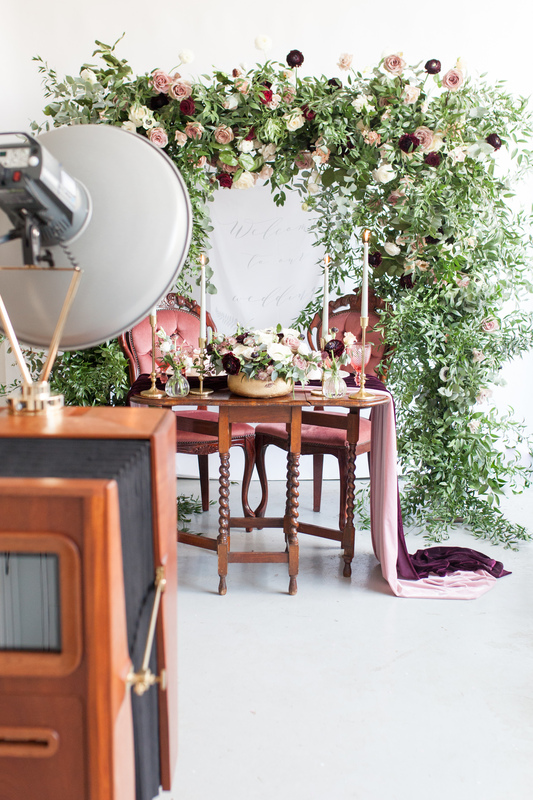 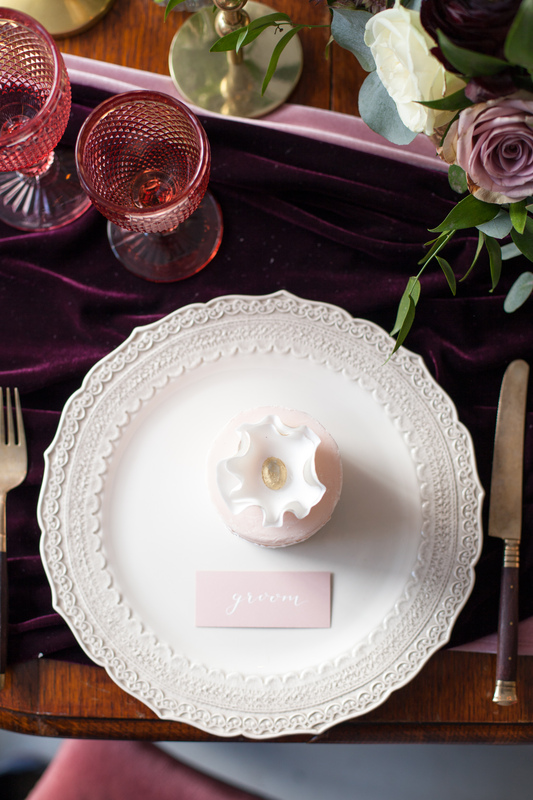 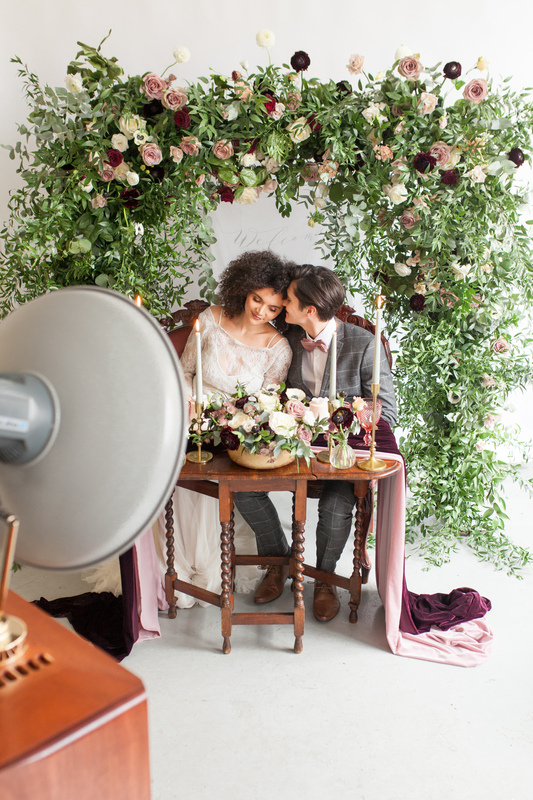 The Accordian booth, in rich timber tones, called for something altogether more dramatic – so I brought together mahogany and rich berry shades to an ethereal and romantic sweetheart table for our very own Romeo and Juliet. If you’re considering a sweetheart table, this gorgeous scene will provide plenty of inspiration I’m sure! 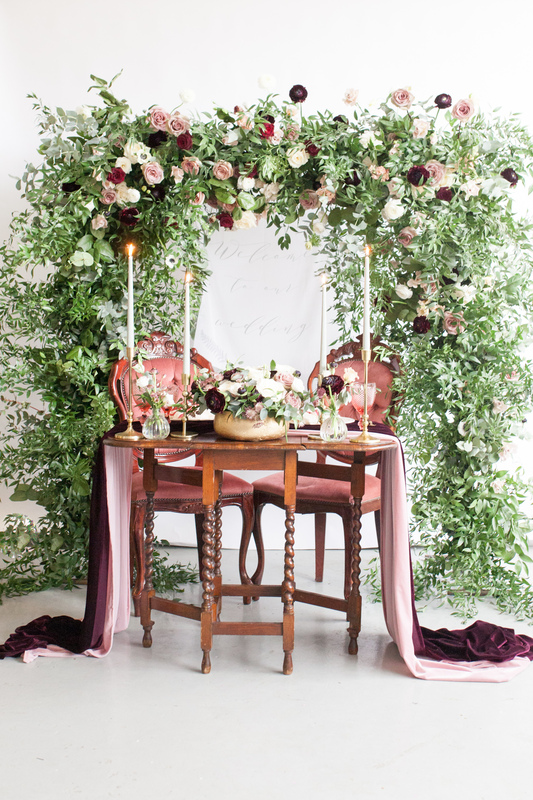 Emma outdid herself, with an incredible floral archway, combining trailing jasmine and romantic pink roses with pops of deep burgundy and reds, complimented with a matching table arrangement set off against the most gorgeous pink and burgundy velvet runners (supplied by Magpie Linens). 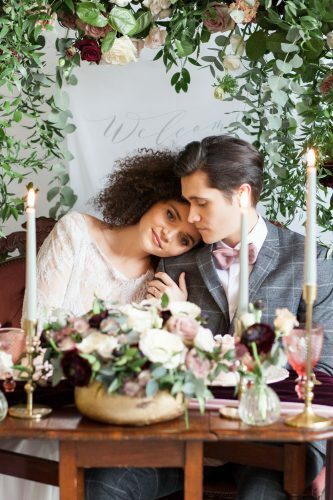 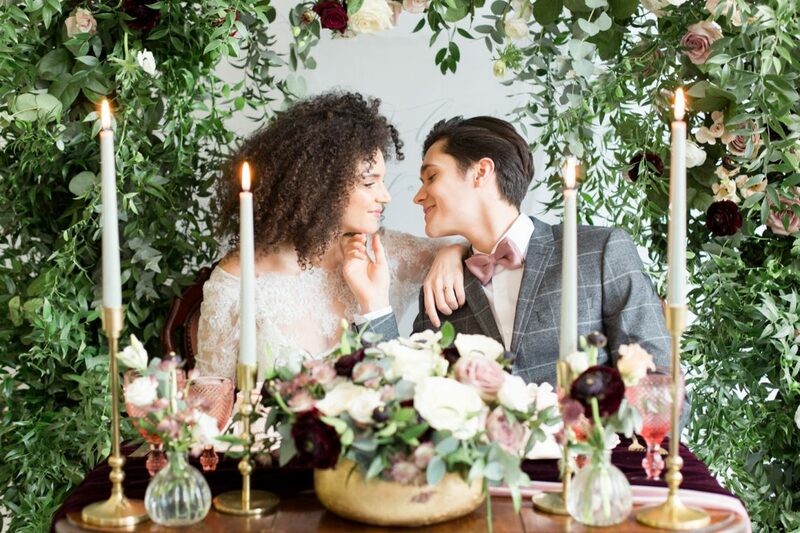 Hire Love supplied the most stunning collection of antique furniture, from the mahogany sweetheart table to pair of dusky velvet covered chairs and pretty love seat featured in the lounge setting. 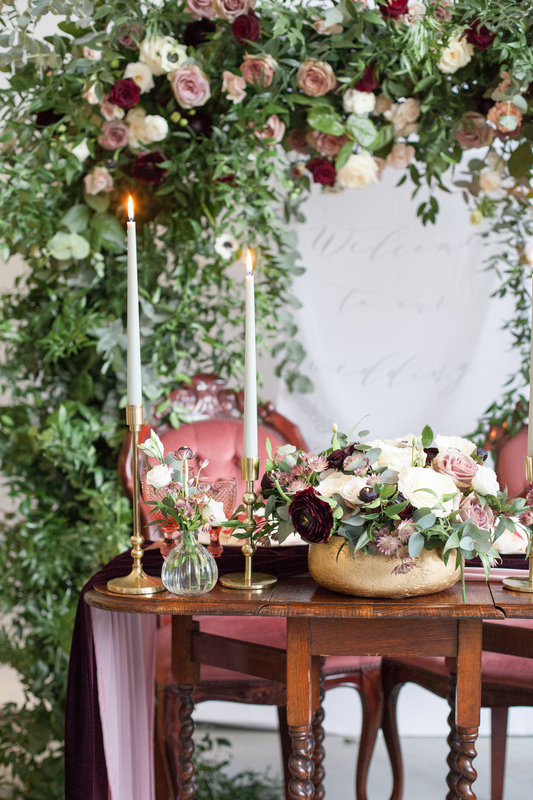 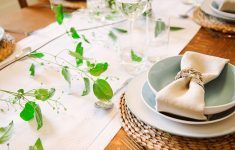 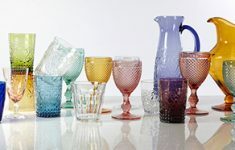 The table top, laden with fresh blooms, pretty tableware (from Classic Crockery) and flickering candlelight sets the scene for your very own midsummer night’s dream. 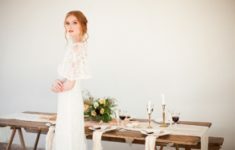 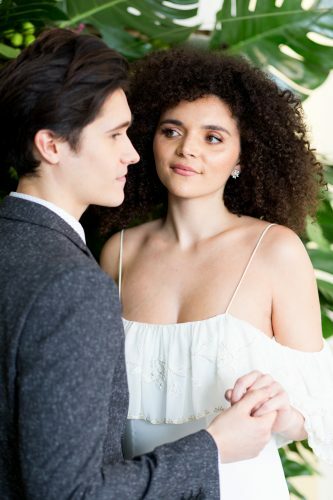 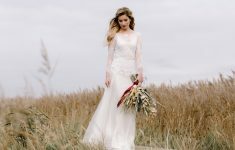 Once again, Luella’s provided the perfect bridalwear, this time from their in-house collection, with lace sleeves and chiffon skirt adding a sense of modern romance to Amy’s look. Can I just mention how much I’m loving her curls? 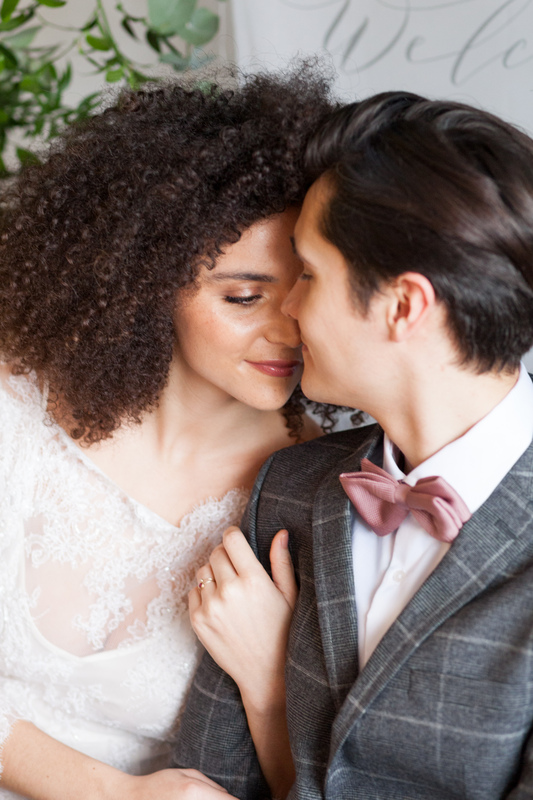 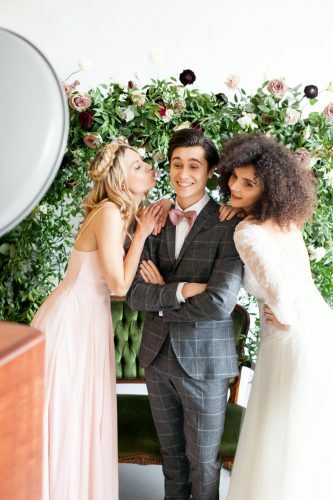 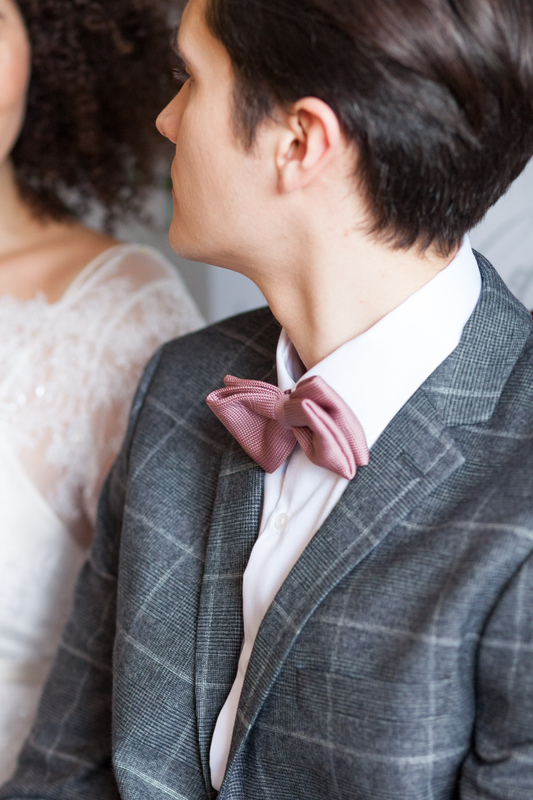 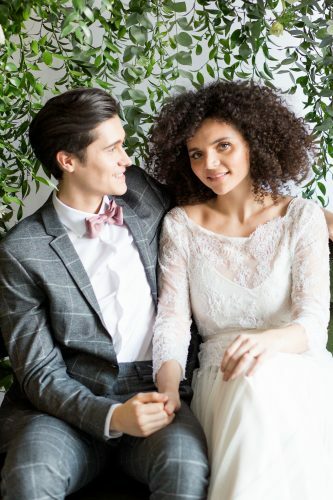 Aleksy brought dapper to the mix, with his chequered suit and dusky blush bow tie, matching Katrin in her TH&TH dress – this time with a fun plaited crown. To round off your evening, what could be more fun than letting your guests loose in beautifully styled lounge with a case full of props! I think these might be my favourite images of all – and definitely some photobooth classics! 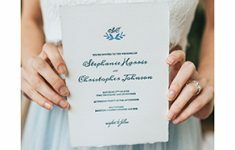 We often mention just how important photography is on your big day, but once the last notes of the first dance have played your photographer will often leave for the night. An Everybooth is a great way to continue getting GREAT images of your guests, and a lot of fun too! We really love the idea of weaving your booth into more elements of your day, not to replace your photographer, but capture those silly moments and get your guests interacting. 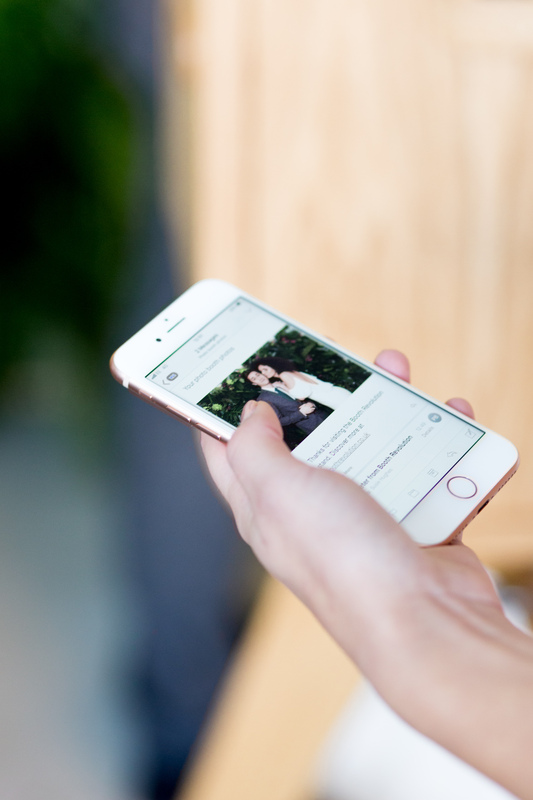 With almost-instant prints you & your guest will have an immediate momento of your day, as well as hilarious GIFs! 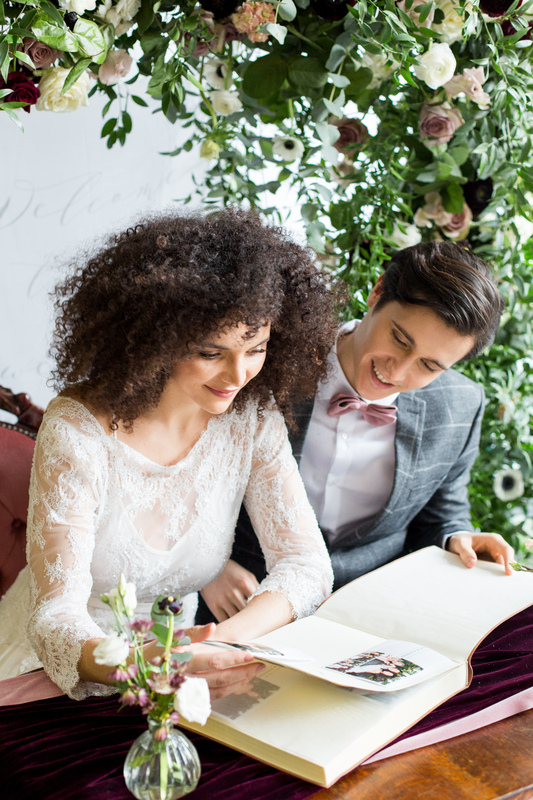 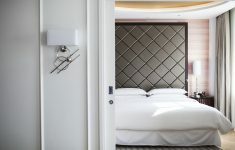 You can even ask your guests to add their prints and well-wishes to your very own (and beautiful) leather-bound guest book on the night, so you can relive the memories straight away. 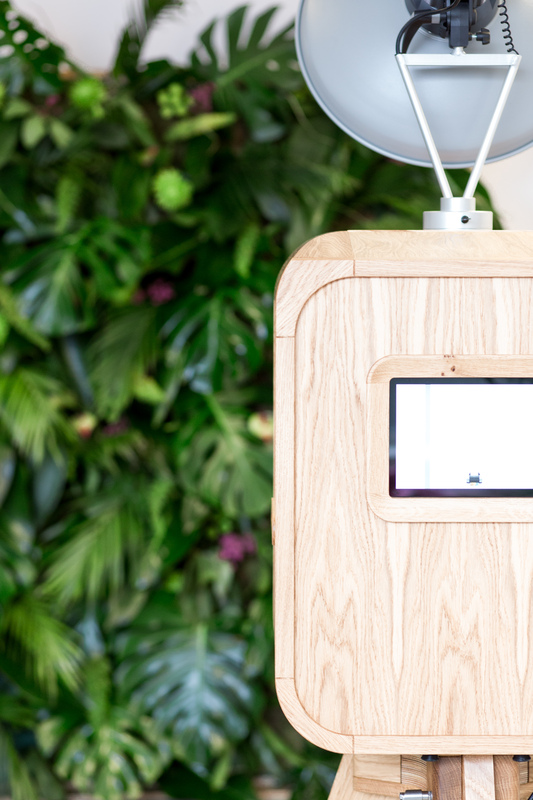 A super-stylish addition to any wedding, Everybooth’s are available around the UK. 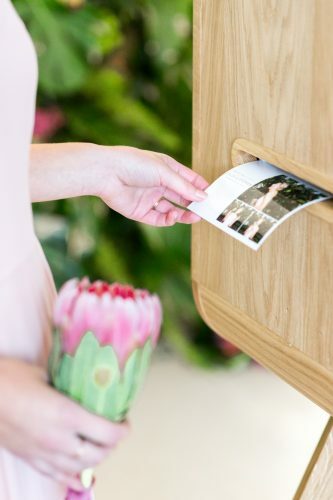 Contact [email protected] to find your local booth!